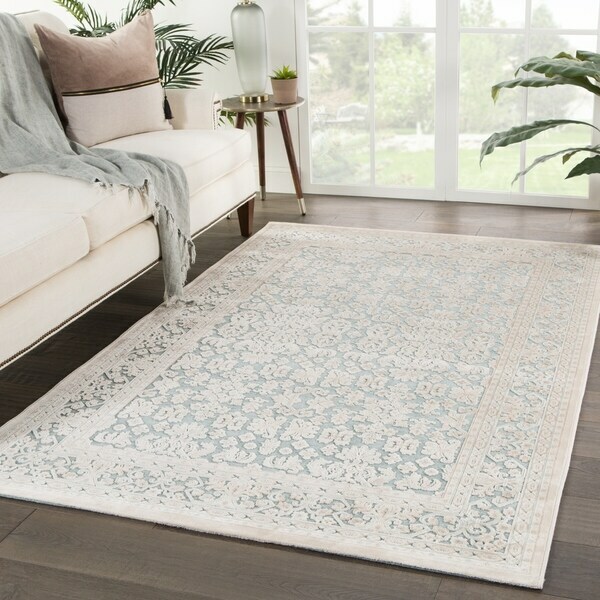 Bristol Damask Teal/ Ivory Area Rug - 7'6"x9'6"
Bristol Damask Teal/ Ivory Area Rug - 8'10"x11'9"
Bristol Damask Tan/ Ivory Area Rug - 7'6"x9'6"
Bristol Damask Ivory/ Pink Area Rug - 7'6"x9'6"
Bristol Damask Teal/ Ivory Area Rug - 5'x7'6"
Soft to the touch and alluring with a distinctive high-low texture, this rayon, acrylic, and polyester area rug lends the perfect accent to bedrooms. An intricate damask-inspired pattern covers this luxe layer with eye-catching detail, while neutral beige offers stylish contrast to the lustrous teal ground color. Dimensions 114.0 In. X 90.0 In. X 0.25 In. RugSmith Sage Ash Modern Floral Area Rug, 7'6" x 9'6" - 7'6" x 9'6"
Bristol Damask Tan/ Ivory Area Rug - 8'10"x11'9"